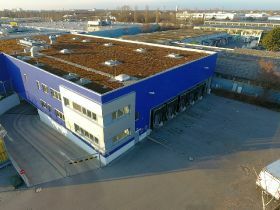 German fresh produce cooperative Landgard has opened a new warehouse and logistics centre in Munich, doubling its storage and logistics capacity in the south of the country. Situated in the Euro-Industrial Park in the Freimann district to the north of the city, the new facility will allow the organisation to push ahead with the expansion of its national and international producer network. The new 2,000 sq m facility has good access to the A9 and A99 motorways and the B13 federal road, allowing produce to reach customers faster. Featuring energy-efficient cooling technology, it is divided into several separate climatic zones, where temperatures will range from 2 °C to 12 °C. In addition, there are several offices and social areas on site to house Landgard’s marketing operations, however the move will not result in any administrative changes at the cooperative. "With the new location, we will be able to make even better use of our proximity to producers and customers in the southern region and offer value-added services to all parties along the entire value chain, be they regional, national or international", said Landgard’s chief executive Armin Rehberg. The modern cooling technology will also allow produce to be more carefully stored and handled, he said.